The renewable energy industry and its proponents regularly draw attention to the industry’s job creation potential. For example, the American Wind Energy Association reported that the US wind industry supported 88,000 jobs at the start of 2016, a 20% increase in one year. The Solar Foundation announced there were over 260,000 solar workers in 2016, which was a 25% increase over the prior year. By contrast, the coal extraction employed only 74,000 workers in 2016, and coal power plants employed another 86,000 workers. The creation of so-called “green jobs,” such as those in wind and solar, is often cited as a justification for promoting renewable energy through tax credits, renewable portfolio standards and net energy metering. I recently had the privilege to moderate a panel discussion on green jobs at the Berkeley Energy & Resources Collaborative’s (BERC) Energy Summit. The panelists were the Energy Institute’s Reed Walker; Carol Zabin, Director of the UC Berkeley Labor Center’s Green Economy Program; and Anna Bautista, Vice President of Construction & Workforce Development at Grid Alternatives. Many economists remain skeptical of green job claims as a motivation for policy. Severin Borenstein has emphasized that job creation claims usually cherry pick data. To understand the effects of a policy on employment one needs to consider the effects throughout the economy. If a policy is promoting a more expensive form of energy, it could very well be destroying jobs on net. Our panel discussion didn’t address these issues. Instead, the discussion explored equity issues surrounding green jobs. Who benefits? Who doesn’t? Are green jobs “good” jobs? I left the discussion doubtful that policymakers should view the growth in the number of green jobs as a solution to job losses in other, less green, parts of the energy sector. At the same time as solar and wind employment is skyrocketing, coal industry jobs are plummeting. Energy Information Administration data shows a 25% drop in coal mining employment from 2008 to 2015. In 2015, 94 coal-fired power plants with a capacity of nearly 14,000 Megawatts closed. Read more about the decline of coal here. “Coal Miners Memorial – Richlands” by Big Ed’s Photos is licensed under CC BY-NC-ND 2.0. Reed Walker has done research showing just how painful job losses can be to workers. His research looked at how the 1990 Clean Air Act Amendments affected workers in newly regulated firms and industries. The basic idea is to compare workers’ earnings trajectories in newly regulated sectors compared to similar workers in other sectors, before and after the regulations went into place. While many workers were unaffected by the regulatory change, the present-discounted earnings losses for displaced workers after the policy change exceeded their pre-regulation annual earnings. When workers lose their jobs and have to find employment in another industry, their incomes drop significantly, on average. First, the coal job losses and renewable job gains are happening in different places. This means relocation costs pose a significant barrier to workers switching from coal to renewables. Second, renewable energy jobs pay less. The median wage for solar installers is 20% below that of coal miners. Third, the skills needed in an extractive industry like coal mining are very different from those needed in a construction industry like solar or wind. Putting forward green job creation as the solution to coal industry workers’ woes is unlikely to be well received by miners. While coal miners might not be landing green jobs, other workers are. Are green jobs sustainable opportunities for these workers? Analysis suggests the reality is mixed. The majority of green jobs in solar are construction jobs, that is, installing systems. A 2016 report from UC Berkeley’s Labor Center by Betony Jones, Peter Philips and Carol Zabin analyzes differences between construction jobs in the utility-scale segment of the renewable energy industry and jobs in the rooftop solar industry. The study finds that in California most workers in the utility-scale segment earn wages and benefits, and receive training that can sustain a middle class lifestyle. The report attributes this to the fact that utility-scale projects in California employ workers who belong to labor unions or receive equivalent wages and benefits to union members. Jobs in rooftop solar, on the other hand, pay lower wages and offer more limited benefits. The Solar Foundation jobs report shows that most solar installers (69%) work on these lower paid residential and commercial distributed solar projects, not on the higher wage utility-scale projects. 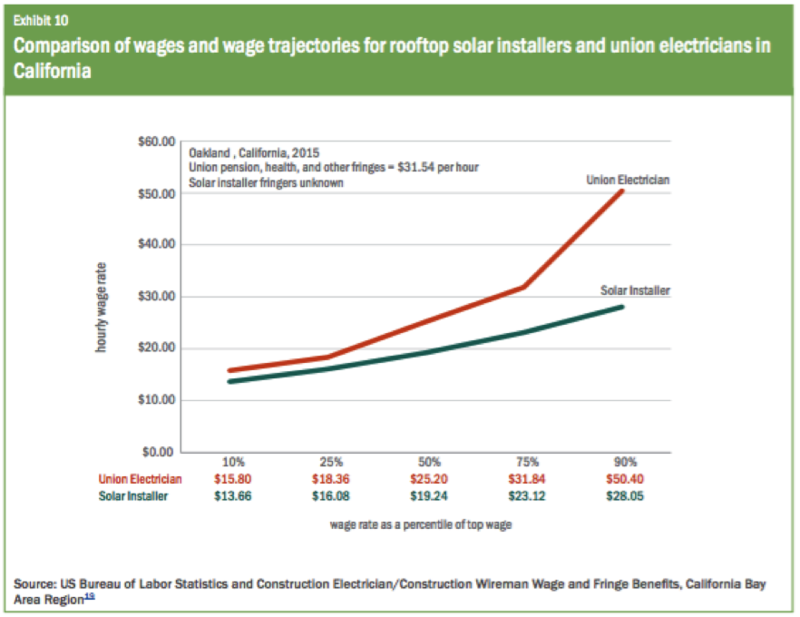 Workers on utility-scale renewable projects in California receive union electrician wages, which are higher than rooftop solar installer wages. SOURCE: Betony Jones, Peter Philips and Carol Zabin. The Link Between Good Jobs and a Low Carbon Future, July 2016, p. 15. The report stops short of arguing that renewable energy policy should favor utility-scale renewable energy over roof-top solar. However, in a separate blog, Jones and Zabin cite one of Severin Borenstein’s blogs and point out that environmental and economic objectives provide a rationale for policymakers to favor utility-scale projects over rooftop solar. Green jobs may not be the solution to coal country’s woes or an inevitable path to the middle class. Yet these jobs are providing meaningful opportunities for thousands of people. In 2016, solar ranked second in employment among energy sectors behind oil/petroleum, but ahead of natural gas. Wind ranked seventh, ahead of nuclear. Groups like Grid Alternatives are trying to increase the accessibility of renewable jobs to the highest need communities. Grid Alternatives is a non-profit organization that trains people coming from low income and minority communities to work in the rooftop solar industry. Rooftop solar jobs may not be as attractive as utility-scale jobs, but Grid Alternatives’ success in recruiting candidates show that these jobs are still desirable to some workers. “Wayne National Forest Solar Panel Construction” by Wayne National Forest is licensed under CC BY 2.0. The growth in the green jobs sector has been extraordinary, and many people have benefited, but green jobs do not cure all energy sector job woes. I worry that proponents of green jobs have set expectations too high. Policymakers and advocates should honestly address the challenges presented by trends in the energy industry. Displaced workers need a sufficient social safety net and workforce training to prepare them for the jobs they are most suited for and most interested in. These may not be green jobs, and that is ok. Meanwhile, where green jobs are being created, workforce training that connects a wide range of workers to these jobs makes sense. This will help put more green in the hands of people who need it most. Previous Previous post: Renewables Dis-integration? Next Next post: Is the Duck Sinking? Why stop at rooftop solar!? All power should come from lycra-clad stationary bikes manned by underemployed college students. Imagine the wattage — not to mention the health benefits, why it will practically pay for itself! And the employment, by goodness, we’ll be able to give jobs to millions to have reliable energy, so we’ll solve the student debt crisis as well! It’s obviously been a while since my last economics class, but isn’t the higher employment a reflection of the inefficiency of the sector — a bug, not a selling point if you will? Furthermore, the weighting of rooftop solar within those job numbers reflects the horrific inefficiency and cost. Given that any careful review of the data (e.g. the CPUC NEM 2.0 proceedings) seems to show costs of distributed solar vastly in excess of benefits, even considering the range of externalities, it seems that economics should inveigh against NEM as the corporate welfare that is, green as it may be. That or put the students to work on the bikes. The framing of the current discussion of coal job loss and clean energy job increases artificially constrains search for an acceptable political solution with reasonably efficient economic outcomes. Scott Sklar’s comment broadens the framing and addresses the locational issue by focusing on the midwest-midsouth states. Too often, however, the policy advocacy is oriented by “clean technology-push” and weak on the locational issue. Kentucky, West Virginia and Southern Ohio have similar circumstances that can address the social and political opposition to declining coal mining employment: (i) expansion of regional natural gas production, and (ii) a huge need for coal mine land restoration. Shifting from coal mining in Kentucky and West Virginia to gas development jobs in other parts of West Virginia, Ohio and Pennsylvania is consistent with historical labor mobility patterns. Most importantly, the industries have significant overlap in skill sets and wage levels. The land restoration requires a generational effort and local labor skills required are similar to the mining industry. Two political compromises will have to take place. First, the current Administration will need a TVA-type “infrastructure” initiative (which can be treated as meeting the promises made during the campaign to restore jobs in coal country). Second, clean energy advocates will need to recognize and accept that expansion of gas production to accommodate coal labor surplus is a positive interim step needed to get by the coal opposition. All of this can be facilitated and accelerated with a revenue neutral carbon tax that distributes the revenue to every household as advocated by the Citizens’ Climate Lobby and the Baker-Shultz-Paulson proposal. Two additional job catagories are interesting in the near-term transition to clean energy for all sectors. Distributed electrification: installing home EV chargers, replacing gas water heaters with heat pump water heaters etc, and Central thermal electrification, e.g. using directional boring machines to make district thermal loops for heat pumping the exchange of warmth and coolth between diverse users (cyclical thermal economy?). By introducing more techniques for greening the satisfaction of “energy needs”, more job types are created while “duck curves” and “hockey sticks” may be tamed at lower costs. If on their days off, say, or as a small company benefit, solar installation workers joined together and put solar on each other’s roofs (or did together on some common land, etc. ), thus eliminating the labor cost, the savings in electricity costs might quite quickly pay off the wholesale price of the needed materials, providing each worker of order roughly a $500 to 1000 tax-free (since they are cutting down after tax expenditures) increase in available income as a result of savings on their electric bills. I would hope that there is some such effort going on–and if they wanted, they could perhaps install more than they need and make a bit through credits for their friends and neighbors. A good analysis of why we should be careful about parsing policy around green job growth. A very holistic approach that includes analysis of ancillary jobs is important, but the reality is as the energy market changes the way energy is provided and the labor intensity of energy provision also changes. Looking at ‘green jobs’ that maximize sustainable employment across a lifecycle not just of an energy facility or facilities – but of the chain of supply, etc. might also better help us target some areas where there is opportunity for sustainable job growth. A green jobs platform is not an optimal one to spur clean energy/transportation to the next level – but a focus on an inclusive economic model for this growth across sectors will likely show a better long term outcome. While all data is selective, the author should be looking at biomass jobs and wind turbine assembly and installation, not solar. The States of VA, KY, OH, TN, PA where coal mining is centered in the eastern US, have large forests, which can be sustainably maintained, and use similar skills to harvest, grind, and generate electricity. Wind sites are also in the mountainous areas where miners live, and require “heavy trades” skills. MIT says half of US geothermal reserves are along the Appalachian mountains and could provide a minimum of 10% US electricity. These utility-scale industries are competitive with coal, do not cost more — have less harmful wastes, and have less harmful health impacts to workers. The author conveniently left out the brown and black lung disease that US taxpayers pay yearly for the diminished health of these workers. Also failed to mention the repeal of the rules on dumping coal wastes in mountain top streams that put heavy metals and toxins in the watersheds, wells, and river ways that cause cancer, and whose chemicals are immune suppressors and hormone disruptors – and that somehow that has no social or economic consequence. Overall, this paper cherry picks its facts as well. Scott Sklar, Adjunct Professor, The George Washington University (GWU) and Steering Committee Chair of The Sustainable Energy Coalition. Very accurate response to this article’s somewhat myopic findings. Solar is only a piece of the mosaic of renewable energy and storage resources that will make up a sustainable energy future. You’ve pointed out wind, biomass and geothermal as appropriate resources for these regions, but I would also add to that list energy storage resources such as pumped hydro and compressed air/natural gas. The region’s abundant yet accessible mountains are good sites for pumped hydro reservoirs, and its cavernous coal mines and depleted natural gas deposits can be retro-fitted to store and pressurize air or natural gas. The region’s location between the wind-rich Midwest and eastern population centers would provide convenient siting for stored energy in a sustainable future that must be accompanied by a significant build-out of HVDC transmission lines. If this article highlights anything, then it is the difficulty of switching between industries for blue-collar workers. If we are to achieve a sustainable future, all Americans must benefit and these communities that have a disproportionate share of their economies devoted to the energy sector must be included in that future – this may be one solution. Good article. Solar and wind are getting cheaper, but as far as I can see, if they cost more /kWh, then in a reasonably stable state economy that means more jobs- where else does the money go but through employment at some stage? Absolutely, and this equivalence with higher costs shows that “more jobs” is a bad thing, all else being equal. Solar advocates should really be make excuses for solar hogging such extreme amounts of labor, not celebrating it.